In the latest bid to counter rising inflation, Brazil has announced the scrapping of federal taxes on certain food staples and toiletries. President Dilma Rousseff said that tax breaks on household staples should lower the price of products by between 9.25 per cent and 12.5 per cent. 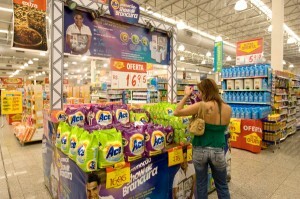 Brazil’s benchmark IPCA consumer price index rose 0.60 per cent in February, the statistics agency IBGE said last week. “I don’t overlook inflation controls for a single moment because economic stability is crucial for all of us,” said President Rousseff, adding that the move will cost her government 7.4 billion Reais ($3.8 billion) in tax revenues a year. She addressed the nation in a televised speech hours after the figures were revealed. The index had risen 0.86 per cent in January. She also added three toiletry items to the list of 13 products in the basket of goods, which includes beef and beans, deemed essential for a Brazilian family to live for a month. ”That’s why I don’t stop looking for new ways to reduce the cost of life of Brazilians and protect their purchasing power,” said the president. “The committee will accompany the evolution of the macroeconomic environment until its next meeting, to then define the next step in its monetary policy strategy,” the statement from the bank concluded.